Mark Rylance, arguably the greatest stage actor of his generation, already has three Tonys, two Olivier awards and a TV Bafta to his name. But he remains modest about the Oscar buzz around his latest film role as a Soviet agent in Steven Spielberg’s Cold War thriller Bridge of Spies. “I try to ignore it, personally, but I’m aware that it’s going down well,” says the quietly spoken English actor, director and playwright. In Bridge of Spies, Rylance plays real-life Soviet intelligence officer Rudolf Abel, who is arrested in 1950s New York and prosecuted as a spy. 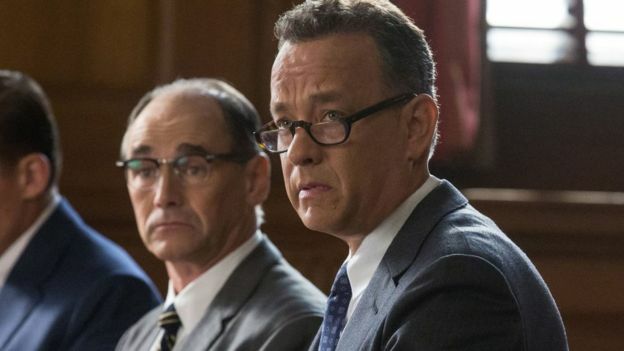 Abel’s case is taken up by a principled insurance lawyer James Donovan, played by Tom Hanks, who wants to ensure Abel receives a fair trial. Donovan is plunged into the middle of a Cold War crisis when the CIA asks him to secretly negotiate a prisoner swap involving Abel and the pilot of a captured US spy plane. One surprising fact about the Abel is that he was born in Newcastle-upon-Tyne and was originally known as William August Fisher. 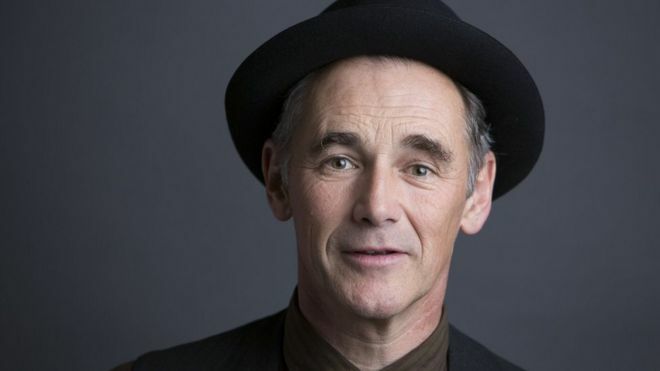 “The only person I met who knew about him was Sting,” Rylance says, explaining how he met the Tyneside-born former Police front man after filming was over. “Sting knew that he was a famous Geordie Russian spy. He said, ‘I hope you’re playing him as a Geordie.’ I said the research I had was that he sounded Scottish. I dodged a bullet, because Geordie is a very difficult accent to do. “I read that Abel and his father handed out flyers during the First World War trying to convince young English men not to sign up for it. So he’d obviously been involved very politically from a very early age before they then returned to Russia. Rylance was cast in Bridge of Spies after Spielberg saw him on stage in the hit all-male production of Twelfth Night, in which a cross-dressing Rylance played Olivia. His other best-known stage work includes Jerusalem and Boeing-Boeing. For 10 years, he was the artistic director of Shakepeare’s Globe. This is Rylance’s biggest film role to date – other movies on his CV include Anonymous and The Other Boleyn Girl – and Rylance says he felt well prepared after playing Thomas Cromwell in the recent BBC adaptation of Wolf Hall. “The 17-week shoot, playing a character who was so secret and quiet, was a very intense period of work,” he says. The actor says that he doesn’t mind the lack of rehearsal time that comes with film. In the theatre, he says, rehearsals should be about creating performances that can “grow and change” throughout the run. “I don’t work with theatre directors who try and lock down a production for the press night and then you have to be the same every night. I just won’t do that,” he says. 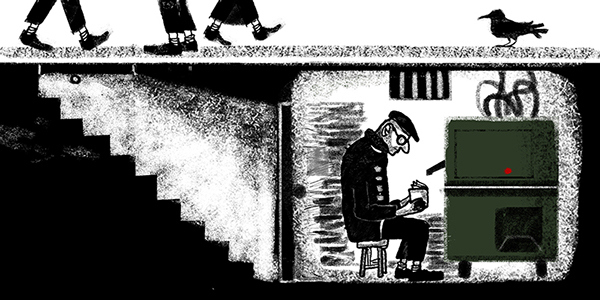 Bridge of Spies might be Rylance’s first collaboration with Spielberg, but it’s not the last. The director was so impressed with Rylance that a week into filming he gave the actor a copy of the screenplay for his next project, a big-screen adaptation of Roald Dahl’s The BFG. “I thought he just wanted my opinion of it,” says Rylance. “I didn’t realise he was actually offering me the part of the BFG. The film was shot in Vancouver earlier this year and is now in post-production. “It was motion-capture so my performance lives only in a computer,” Rylance says of his role, the titular Big Friendly Giant. Roles don’t come much bigger than that, but for now all eyes are on Rylance to see if his quietly powerful turn as a Soviet spy will add another statuette to his trophy cabinet. Bridge of Spies is released in the UK on 26 November. 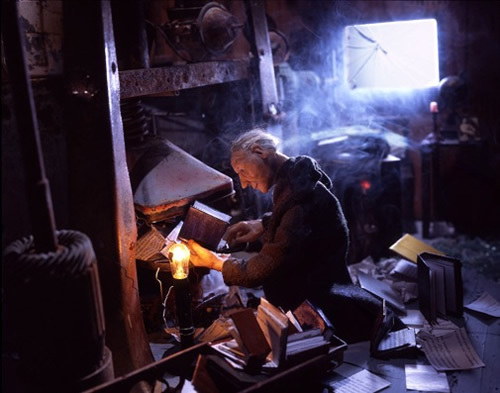 The BFG is out in summer 2016.